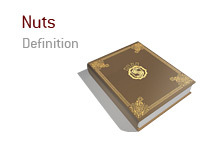 In the poker vernacular, 'the nuts' is the best poker hand possible, an unbreakable, unbeatable arrangement of cards. The nuts vary between formats and even individual hands, where circumstances dictate the top possibility. In other words, the nuts, or 'nut hand,' is the greatest potential poker hand for a given situation. Books on poker will often refer to the second most valuable hand as the second-nut hand, to the third as the third-nut hand and so on. The nuts and related terms are mostly commonly used in community card poker, such as Omaha and Texas hold 'em, because the board is what provides the information that lets a player know that he or she has the nuts. It is important to note that the nuts can, and often do, change as the board unfolds; for instance, if the flop is 5-6-9, then the player holding 7 and 8 has the nuts, but if a 7 comes up on the turn, then 8 and 10 would become the nuts. It is also worth noting that the absolute nut hand is not always the same as the actual nut hand; for example, if the board is 2-5-7-K-K, K-K is the absolute nut hand, but the player holding K-7 knows that he has the actual nut hand.